Careful With That Axe, Eugene: SOLD OUT! 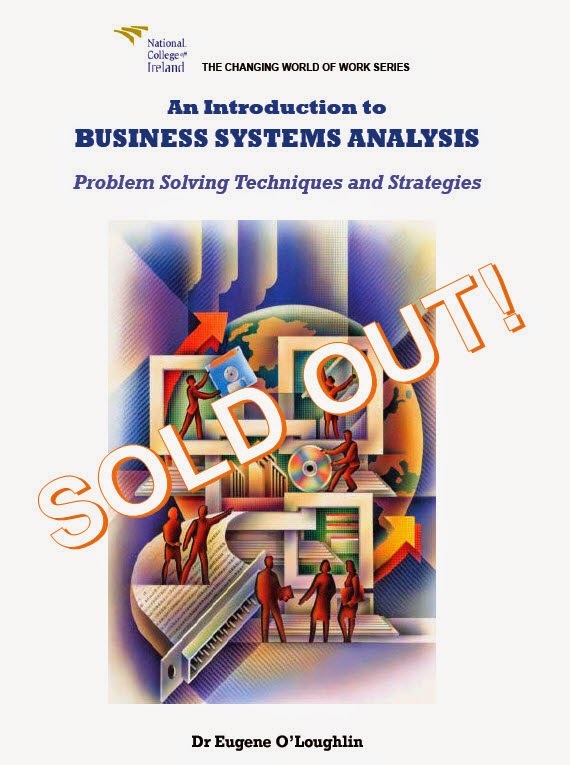 "An Introduction to Business Systems Analysis"
SOLD OUT! "An Introduction to Business Systems Analysis"
My first ever book is officially "Out-of-Stock"! Yesterday I picked up the last seven copies available from The Liffey Press of "An Introduction to Business Systems Analysis". This book was published in early 2010 and all 1,000 original print copies are now out of supply at the Liffey Press distributors. It has taken nearly five years for this to happen, so it has been a slow seller. At least I didn't have the indignity of having excess copies of my book pulped as happens when books don't sell. The book is still on several college reading lists - Algonquin College in Ottawa are the latest to recently add it. As we are out of supply it is likely that they will use an eBook instead of printed copies. We are planning to run a second print - this can now be done with what's called "Digital Printing" where any number of copies can simply be printed and bound to excellent quality - a print run of 100-150 more copies is likely. This also gives me an opportunity to correct some typos that escaped my several proof-reads! Below are some sales data rankings from Amazon (Author Central) - this only accounts for books sold through Amazon and not through other sources. I am guessing each peak represents the sale of a single book, followed by a drop in ranking until the next book is sold. The top chart represents sales ranking from Amazon.co.uk - the highest ranking achieved was at the lofty heights of #8,510 on 24th March 2013. The lower chart shows a similar pattern from Amazon.com - the highest ranking achieved here was at #43,845 on 7th April 2014. Very modest figures I think you'll agree, but I'm gratified that it has continued to sell since it was published. Sales and Ranking for Amazon.co.uk. My "Exploring Ireland's Wild Atlantic Way" book is also almost out of stock. It has sold much better and as of yesterday there were just 24 copies left (out of 800 printed last summer). We are also considering a "Digital Print" run for this book, but this is not as easy a decision because this book has a lot (169) of colour photographs and apparently there is a drop in print quality using this quick method.